People always think of Spring Cleaning when they have the urge and make the time to clean out closets, clean up desks, wash the windows and throw away the old. I have another clean out that comes after the holidays. Not only do I put away the holiday decorations and move everything back in place but I also clean out the refrigerator and freezer. It is part of the process of "cleaning up my act" for the New Year. The leftover sweets and snacks have got to go. Since it is also the time to start fresh, I like using up all the frozen items in my freezer. It is a way to make sure I don't keep them in the freezer too long. I inevitable find things I have long forgotten! A good example were the bone-in chicken breasts that were left over from my daughter's birthday dinner in mid-November. Definitely time to use them...but in what dish? This day and age most recipes call for boneless and skinless chicken breasts. I went on the internet and found what looked like a super easy recipe that called for bone-in chicken breasts (after all who wants to work hard in the kitchen post holidays!). 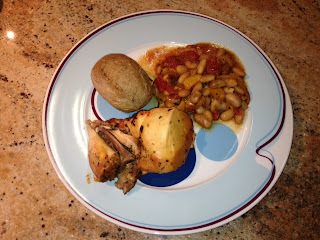 It is from the Cooking Light website and is called Provençale Chicken Supper. The flavors were great and it really was easy for my daughter to make. The disappointment was that the meat was very dry. My experience has been that white chicken meat is hard to cook without becoming dry, especially without the skin and bone-in. I want to try this recipe again with chicken thighs. My bet is it will be much more successful. This recipe is so easy and tasty I don't want to give up on it yet! The Provençale Chicken Supper was 281 calories per serving and it served 4. To complete the meal I added a simple salad with 2 tablespoons of dressing for 60 calories and a whole wheat roll for 110 calories. The total calorie count for the meal was 451. This will only be a repeat which a different meat.